SAN ANTONIO -- Wolff's Stadium's reputation as a pitcher's park remained intact for the most part during Wednesday night's 75th Texas League All-Star Game. Despite the lack of offense, San Antonio third baseman James Darnell provided enough punch to complement the South pitchers' seven-hit outing by belting a two-run homer en route to a 3-2 victory over the North before a crowd of 6,121. For Darnell, who also showed his defensive heroics with a clutch snag from left field in the ninth, being part of the All-Star contest on his home field was enough of an honor. 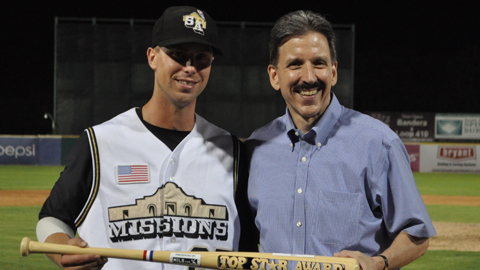 Being named Most Valuable Player added a little something extra for the Padres prospect. "This definitely was better than I thought it would be," Darnell said. "Sometimes you wonder if you're going to be in the Minor Leagues forever. But I have a lot of faith and take it one day at a time. To get this award with all these great players is a big honor. I want to keep working as hard as I can and move up as soon as possible." The South got on the board in the second when Michael Spina (Midland) opened with a double off Christian Freidrich (Tulsa). He went to third on a single by Corpus Christi's J.D. Martinez to shallow left and scored on a fielder's choice. The big blow followed an inning later. Jermaine Mitchell (Midland), who went 2-for-2 with a walk, led off with a triple. Darnell lined his two-run homer over the left-field fence one out later. He came close to ripping a three-run shot in fourth, but the ball sailed foul. "The home run was great," Darnell said. "I was trying to make contact. I couldn't really tell what kind of pitch it was. I was just trying to do something. "I really thought I had that second one too. But I lost it, because it was pretty high and I couldn't tell if it carried foul." Casey Kelly (San Antonio) set the tone with a perfect inning in the first. Martin Perez (Frisco) followed suit in the second, but Jorge Reyes (San Antonio) and Dallas Keuchel (Corpus Christi) had to work out of jams. Keuchel had the tougher obstacle in the fifth. After a perfect fourth, he gave up a leadoff double to Anthony Seratelli (Northwest Arkansas) and allowed Ben Paulsen (Tulsa) to reach first with a wild pitch on a strikeout. After a walk to Darwin Perez (Arkansas) loaded the bases, the Corpus Christi lefty fanned the next two batters to end the North threat. "I didn't want to be our first pitcher to give up a run," Keuchel said. "I just tried to bear down and make better pitches. I found my locations with my change-up and curve. It was good to see I'm throwing my curveball for strikes now." The North finally broke through in the sixth when Matt Adams (Springfield) unloaded a one-out solo home run. And the squad had a chance to do even more damage in the seventh. With one out, Ryan Jackson (Springfield) doubled and scored on a single by Mike Trout (Arkansas). Scott Beerer (Tulsa) singled, but the runners were stranded as San Antonio reliever Erik Hamren escaped further trouble with a flyout and strikeout. "My arm felt great, but sometimes things don't go your way," Hamren said. "You can't let it hurt you when you give up hits. You have to keep focusing on what you are doing. After I got the second out, I was pretty confident I would get the next guy." Darnell's defensive work came in handy in the ninth. After moving from third to left field, Darnell chased down a line drive by Paulsen, making the grab at the wall. Frisco reliever Justin Miller and San Antonio's Brad Brach got the final two outs to seal the victory. "Plays like that are always fun," Darnell said. "The guy stuck it pretty well, but I was able to get to it. I've been getting some playing time there this year. I still have a lot of work to do out there. Making plays like that definitely make me feel more comfortable there." Pat Turner is a contributor to MLB.com. This story was not subject to the approval of the National Association of Professional Baseball Leagues or its clubs.